The lapster (Homarus gammarus) is fund in the eastren Atlantic Ocean frae the Tysfjord near Lofoten in northwastren Norawa tae the Azores an Morocco. It can be fund in the Mediterranean Sea wast o Crete and in the northwastren pairts o the Black Sea an aw, but no in the Easter Seas. Its no aften fund deeper nor 50 metres (160 fit), but can be fund onywhaur frae the law tide merk tae 150 m (490 fit), on haurd substrates made o rock or glaur. ↑ M. Butler; A. Cockcroft; A. MacDiarmid & R. Wahle (2011). "Homarus gammarus". The IUCN Red List of Threatened Species. IUCN. 2011: e.T169955A69905303. doi:10.2305/IUCN.UK.2011-1.RLTS.T169955A69905303.en. Retrieved 7 January 2018. ↑ Lipke B. Holthuis (1991). "Homarus gammarus". 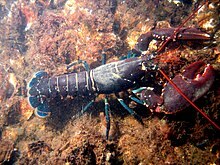 Marine Lobsters of the World. FAO Species Catalogue, Volume 13. FAO Fisheries Synopsis No. 125. Food and Agriculture Organization. p. 60. ISBN 92-5-103027-8. Archived frae the oreeginal on 2010-09-10. Wikimedia Commons haes media relatit tae Homarus gammarus. This page wis last eeditit on 13 Februar 2018, at 06:45.